If you have been reading this blog you might remember that last week I went through my stash and cleaned it a little bit. It had been ages since the last time I had done that so some surprises came up through out the process. I didn't only find a lot of yarn, some of them I didn't even remember why I bought them! But also some of my first "knitting attempts"! I thought I had just thrown them away but (luckily) I didn't. It was so much fun to have them again and see how TIGHT I was knitting! As I said in one of my previous posts it was my mom who showed me the very basics maybe eight or ten years ago. I remember that she gave me a pair of 4mm straight needles and some acrylic wool to start with. She showed me how to cast on (long tail cast on) and make knit stitch and purl stitch. So, when I picked up knitting again two and half years ago under the guidance of Gummi (gingig on Ravelry) and internet it was pretty easy to cast on but when it came to knit wow! I was so stiff! After knitting a tiny rectangle I had so much pain in my wrists! And missing a stitch was terrible! I got paralized and went right away to Gummi crying out for help! My mom tought me to make the knit stitch using the back loop of the stitch. I think that is a normal practice in Chile (actually I confirmed it when my sister came to visit me and I saw her doing exactly the same). That got me a little confused at first because Gummi and most of the turorials I checked in the internet showed knitting through the front loop. So that was a new thing to learn (adding to that the fact that I am lefthanded so it took always an extra effort to undestand things, both for me and for the one who was teaching me). When it came to purling I must say I had a bit more trouble. I just couldn't get it at first. Somehow I was ending up with all my stitches twisted after every purl row. I found the solution to this problem at Knittinghelp... WHAT A GREAT WEBSITE! I learned most of the basic and some more complicated technics there. They have amazing videos and all of them are so clear! But purling kept on being one of my least favourite things to do (until I discovered the Norwegian purling... which is just WONDERFUL). First knitting in the round, cuff and one stripe! After trying knitting flat, I wanted to try circular knitting which gave me the great surprise that no purling was necessary at all! I took my first steps, again, by the hand of Gummi and Knittinghelp. I remember I even tried the magic loop! (but I must admit that I don't like it at all, I prefer double pointed needles) along with knitting in the round I added color: I made one stripe! My first FO was a pair of mittens (I used as a model a pair of mittens that I had bought in the Red Cross) which contain all the things I had learn that far: knitting in the round and making stripes. But I had to learn how to make decreases in order to be able to finish them. I made some mistakes doing that because at the time I didn't understand that my stitches would slant in a different direction because I am leftie. In fact, I didn't even know that the decreases had different slanting directions at all! When I began to knit my goal was to make a lopapeysa. So, in order to so I had to learn fair isle. This is my first attempt: terrible! I was knitting so tight! The floats are too short and the piece of fabric looks horrible! It took me knitting a whole lopapeysa that ended up being too small for me and with a fair isle yoke that was all wavy because of the tension to learn how to make it right. 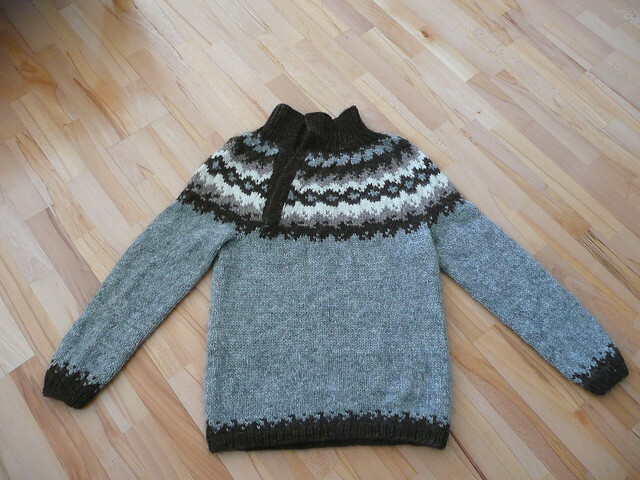 When I finished the lopapeysa and tried on I got so angry because it was too small for me that I frogged it ALL! (fortunetely I took a picture of it, hehe). After this huge fail, I decided to go for smaller projects to learn fair isle. 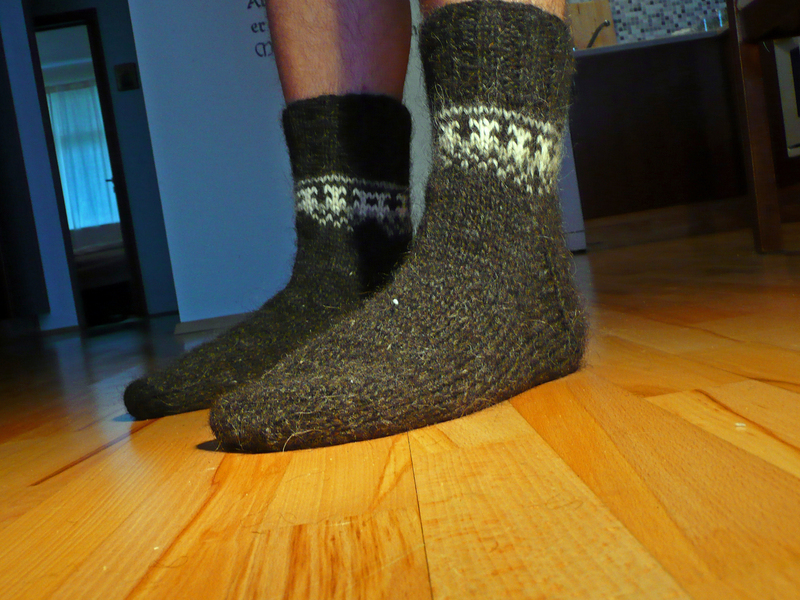 Since I already knew how to knit in the round I went for a pair of socks. I made a simple pattern on paper and started to knit them. The result was ok. At least the tension in the colorwork was good but the pattern itself was aweful. 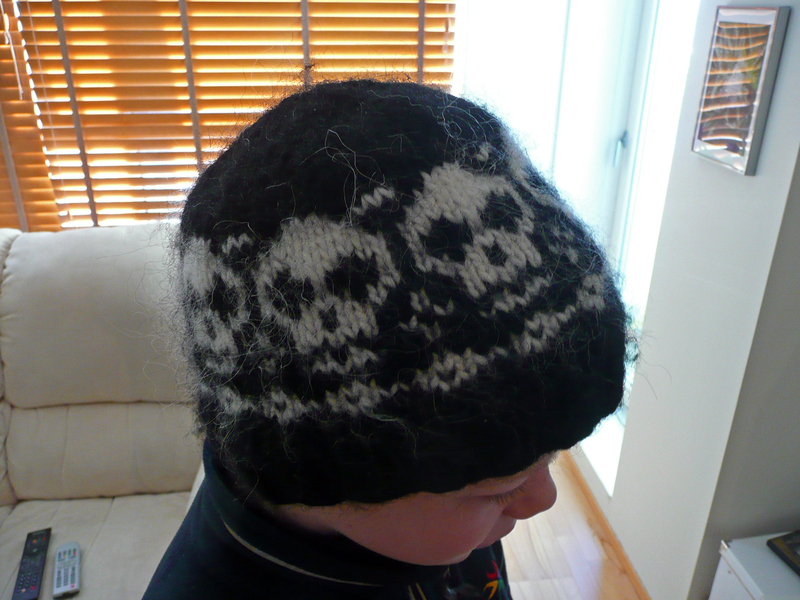 Then I made a hat that looked A LOT better than enything I had knitted before. It was my first nice fair isle project: the right tension, a pattern that looked good and the perfect size! Now that I look back, learning how to knit has been such a nice "journey"! A journey with a lot of frogging but always interesting and fun! That's almost about me. But you're simply genius. Good luck in your future projects. I never realized there are so many differences in knitting from country to country! You are a persistent and amazing fellow to figure it all out and then move on to fair isle - and then to laces! I really liked the colors and the design of "First lopapeysa: FROGGED"
Con tu blog vamos a saber muchas cosas e interesantes. Ance! Hi! How funny is that! I am still laughing at the "bulletproof sweater"!! Who told you that is just genious! hahahaha! It is just a matter of time to star loosening. I remember my first attempts of knitting were even painful! I remember that first lopapeysa... it was very colorful! Voy a checar esa manera de hacer los reveses, a ver que tal! Martha! Mira, no tenía idea de que en México también tejían por la patita de atrás! El revés noruego es lo mejor porque no tienes que mover el estambre hacia el frente. Parece complicado al principio pero (como todo) una vez que lo entiendes y aprendes es MARAVILLOSO. Cuéntame qué te parece, sí?? Ég vildi að ég ætti eitthvað að því sem ég prjónaði hérna í den, væri sko gull og gersemar!